The age old argument with our generation: Form vs Function. 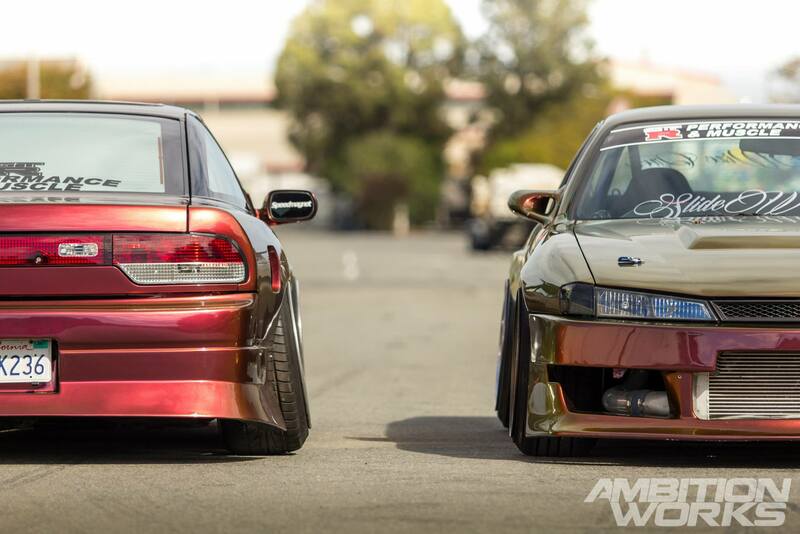 It’s a forever raging battle between the elite and purests of the automotive world and one that we will not conclude today. Instead I want to focus on a different sort of battle. A battle between the brave and the shy, the fluoro and the camo, the loud and the quiet, you either stand out like the wolf or blend into the flock of sheep. Today we are going to stand out and run with the wolves. Having never been to Christchurch in my 21 years of existence I was both amazed and shocked at the amount of damage the earthquake had caused throughout the inner city and outer regions. Many people had fled from their houses, shops had been looted of their belongings. Even after 3 to 4 years the government are still working on rebuilding the city to its former glory. It’s a hard choice to pick between starting fresh and rebuilding old because of Christchurch’s rich history. It was great seeing the city, but I didn’t really fly 1000kms to see just buildings. 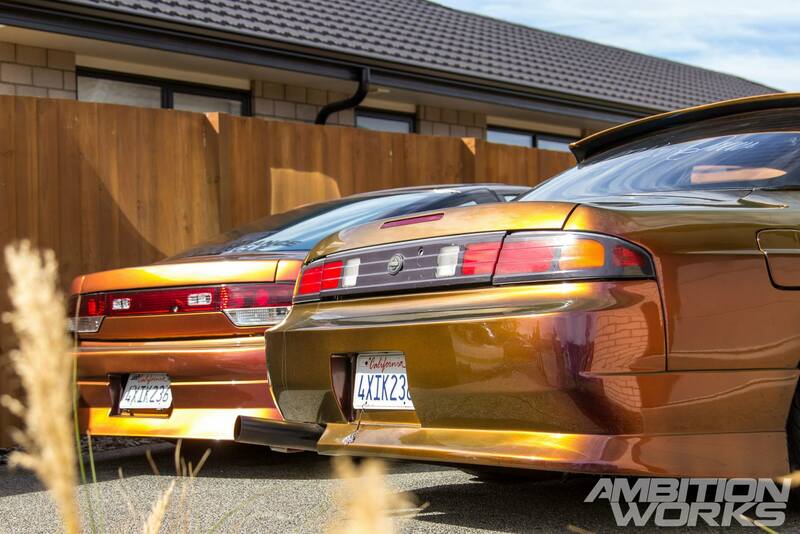 I made that trip to discover the automotive scene and all its media portrayed boyracer heaven. Today we visit Cany and Jared from Christchurch just outside of the earthquake ridden city centre. 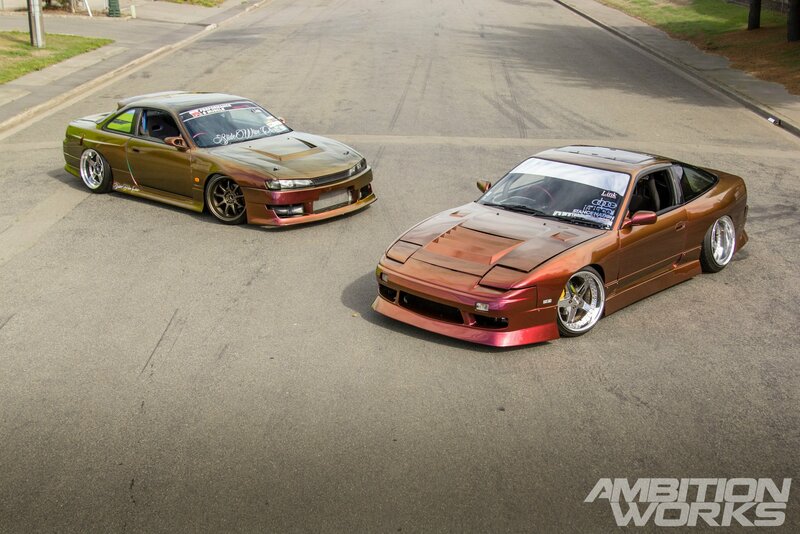 Two people that stand out on the daily and their cars are no different. It was a bit of a tease seeing them parked on the grass by the Link ECU tent during the 2 day D1NZ Christchurch spectacular. Monday finally came along and I was about to be treated to two of the freshest Silvias that reside in lower part of the South Island. With no time limit and a whole city to roam, we finally found a quiet industrial park that would suit our somewhat legal activities. 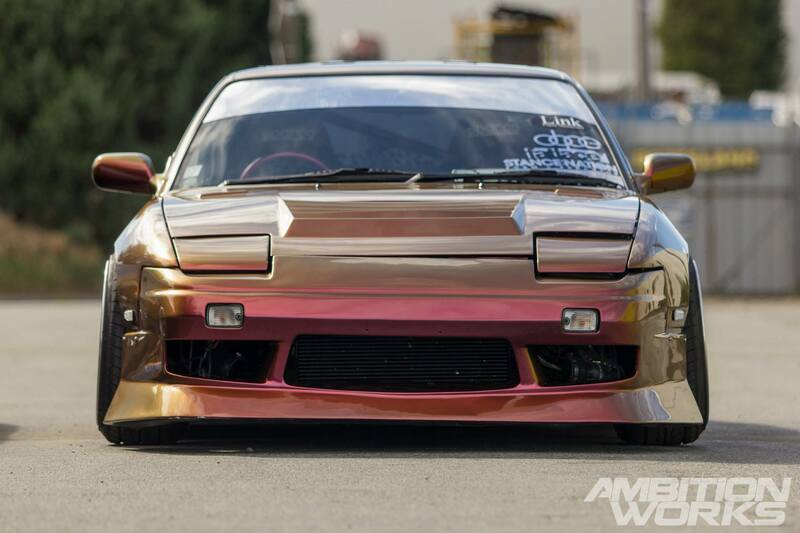 Jared owns this 180SX. A car battery salesman by day and a car enthusiast by night. 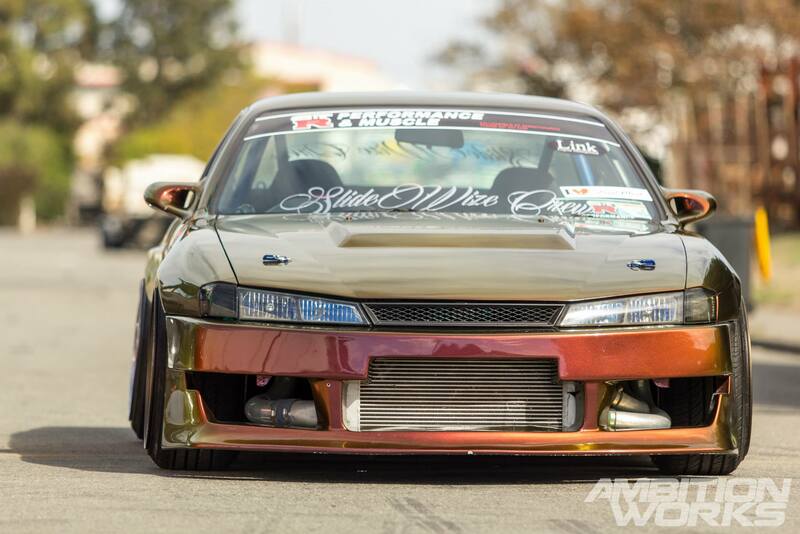 The S14 is property of Cany who is an automotive painter by day and by night. It’s a rather funny story of how these two came to be best of friends. One late night, it was the usual weekend antics. Cars were out, people were doing questionable things in questionable cars. Jared saw that the keys were in Cany’s Silvia with the engine running. With a few drinks down he took it upon himself to take it for a quick lap of the block, and when he didn’t return Cany got suspicious. They went looking for it and found that Jared had crashed. Being the stand up guy that Jared is, he took the bullet and bought the crashed car off Cany. Little did they know it would spark a friendship for many years to come. How does one stand out? What does it mean to be different? It takes a lot of effort to stray from the ‘lowered on mags’ boyracer starter pack. Just like any art form, you need to find people that inspire you and draw from their talent and creativity. The same goes for modifying cars, find a handful of drivers, builds, garages and pull a little bit from each of their styles but don’t forget to add your own. Don’t be afraid to step on the line and push the known boundaries, it’s when you challenge what you think you know when pure creativity genius happens. Jared and Cany sure have chosen a different path for the engine transplants. Gone are the old original CA and SR engines, replaced for bigger turbos and more litres of combustible space. 2 litre engines just don’t seem to cut it these days powerwise, however I’m fine with that as the CA and SR engines hitting the rev limiter aren’t the most flattering sounds to be bouncing around in my ear drums. Jared has chosen the 1JZ which gave an extra 500cc capacity of the original SR engine. 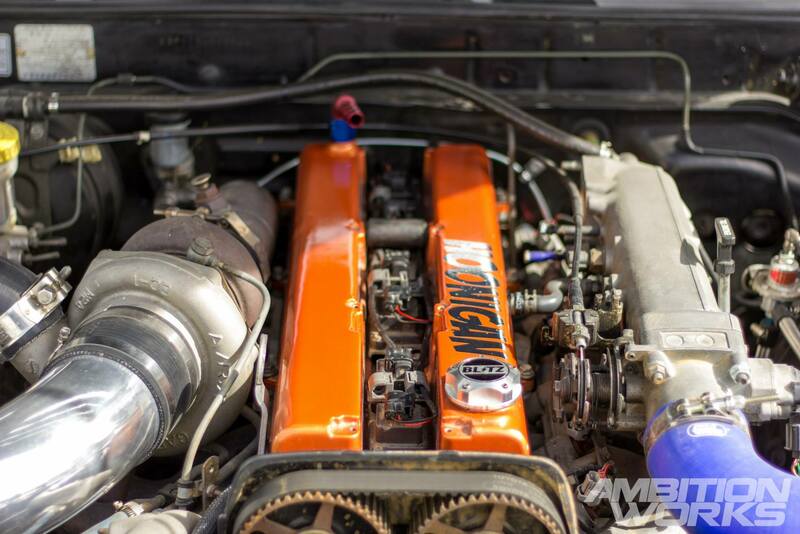 The 1JZ is the non VVTi version with a Garret 35/40 turbo attached. A massive set of 1000cc injectors and a custom made titanium exhaust. Controlling all of the these nice new upgrades is a Link G4 ECU which pushes out 420 HP on E30 Ethanol. With all of this power a R154 gearbox has been sourced along with a sturdy 3000 pound clutch to successfully put it to the ground.. 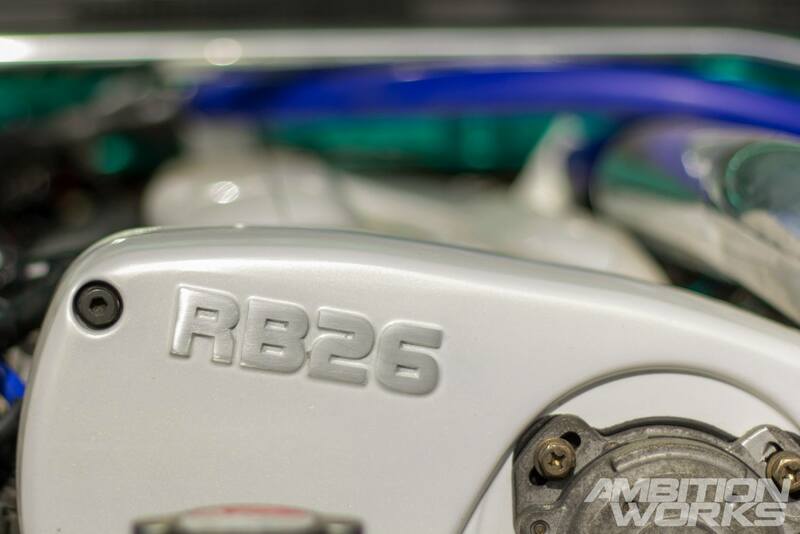 The infamous RB26 engine to rival the nearly equivalent in size 1JZ, this is the engine that Cany has gone with in his S14. He has kept the twin turbo setup with a set of N1 turbos. An apexi power FC, Tial 50mm BOV, 550cc injectors and a 500hp fuel pump help the car produce a reliable 350 usable HP at the wheels. The engine bay has been fully detailed to get the most wow factor possible, in a crazy green colour. To go along with the crazy look of the engine and engine bay, the car is fitted up with an impressive sound system. A Titanium down pipe, HKS stainless exhaust, and a straight pipe muffler that lets the engine sing rather freely. Adding that much needed cold air into the already thirsty twin turbo engine is a twin entry HKS intercooler connected with a HKS hard piping kit. The coating of the car is something that is being pushed and pushed at the moment, new techniques for painting, new types of coating like rubber give plenty of options for car owners when choosing how they want their cars to look. Since Cany is an automotive painter they decided to go down that path as it would prove to be the cheapest option. 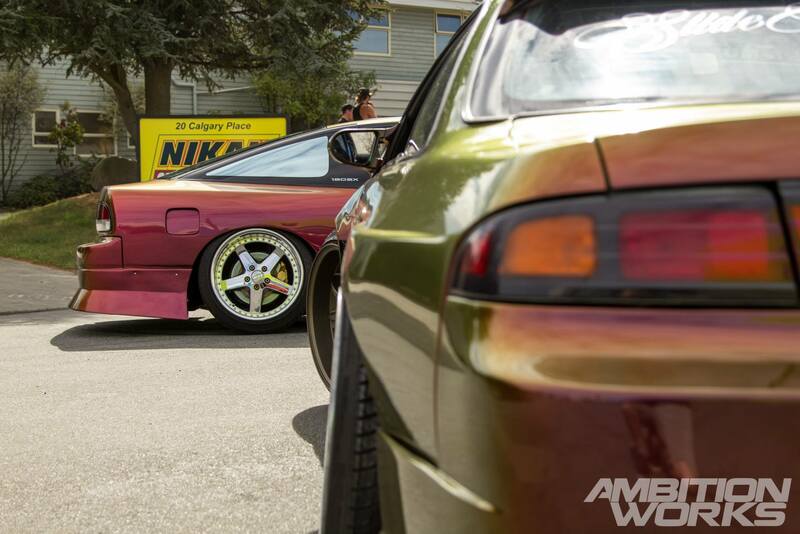 The S14 received a nice lick of custom Mipa Venus paint while the 180SX was given many coats of custom Venus paint mixed together and applied by Cany himself. This paint definitely stands out, it also absorbs its surrounding colours as you can see in the 2nd photo. 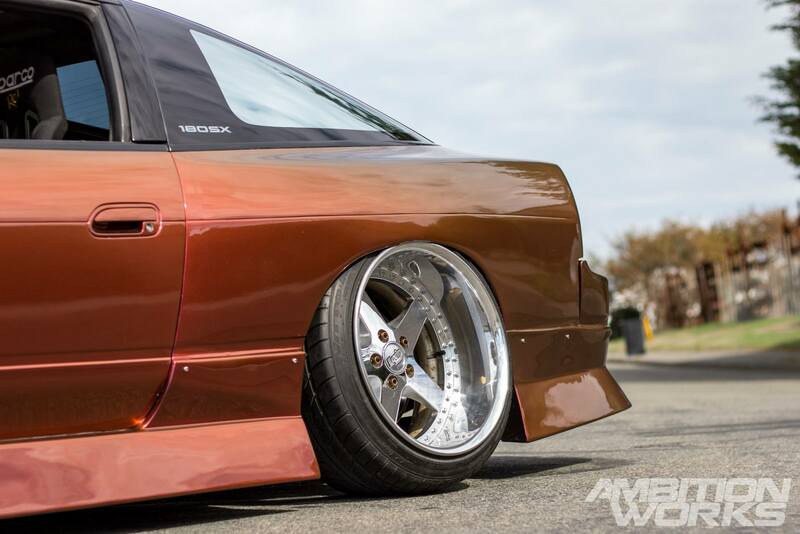 The cars have a variety of aftermarket body parts painted up, including Origin rear widebody and 50mm widened steel front guards on the S14. 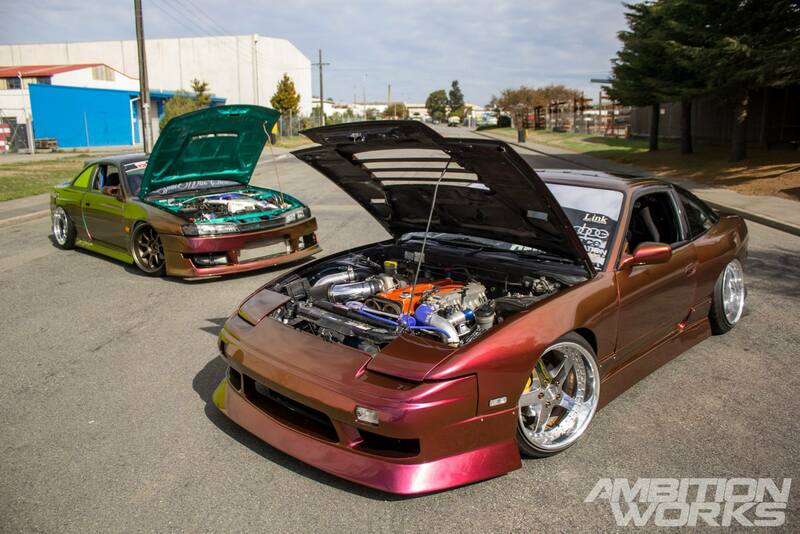 The 180SX sports 40mm fibreglass front guards and 50mm rear guards along with a Uras rear bumper and side skirts. These are two show ready purpose built weapons that know exactly how to stand out, so why would you want to blend in? In this case to avoid the watchful eye of the authority would be an understatement. Luckily for these two, police in Christchurch are a little more relaxed than other places, which means we were able to drive these two cars to the location instead of going through the hassle of two trailers. They wouldn’t even be able to get on most trailers without body modifications. The cars sit just millimetres from the ground below. 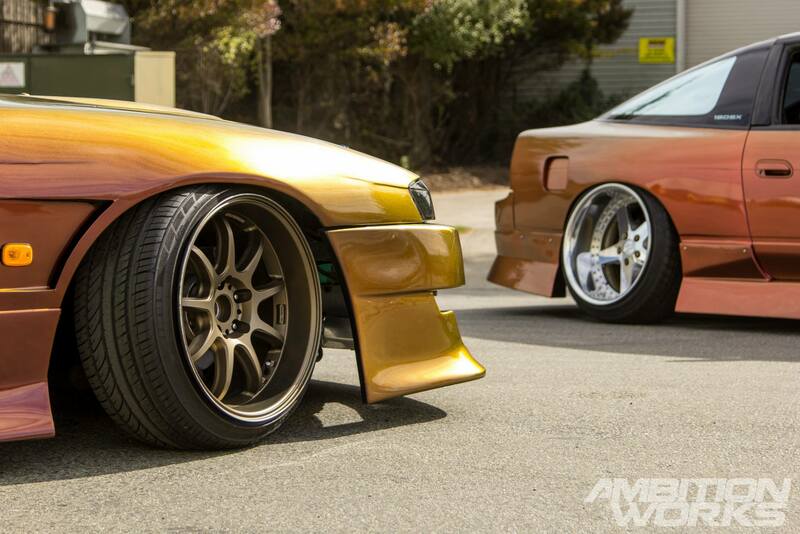 With crazy wide wheels on both cars sitting snug under the widebody fenders. 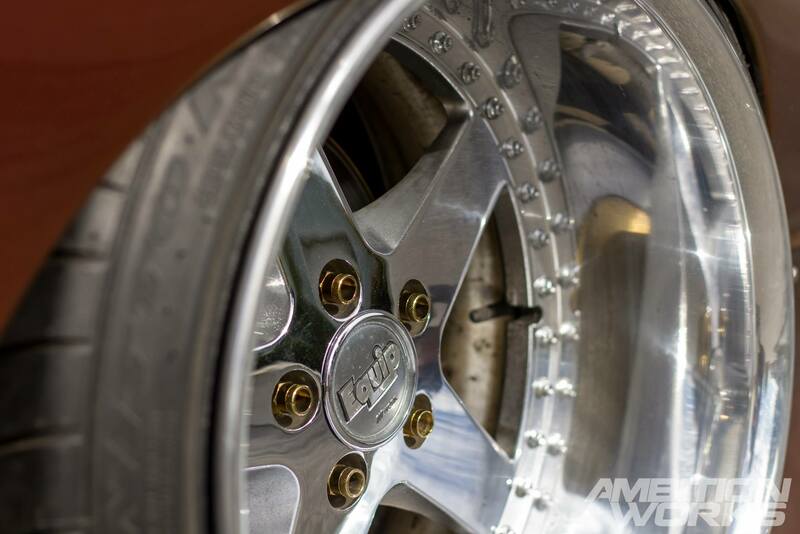 Jareds rocking some absolutely insane 18×11 wide Work Equips out back with an even more mind boggling -32 offset. How he got those wheels to fit, I will never know. Up front sit an ever so smaller set of Equips measuring at 18×10 +18. Suspension wise the cars are looking good, both having a good set of aftermarket adjustable coilovers with upgraded brakes at all 8 wheels, all borrowed from other generous Nissans. 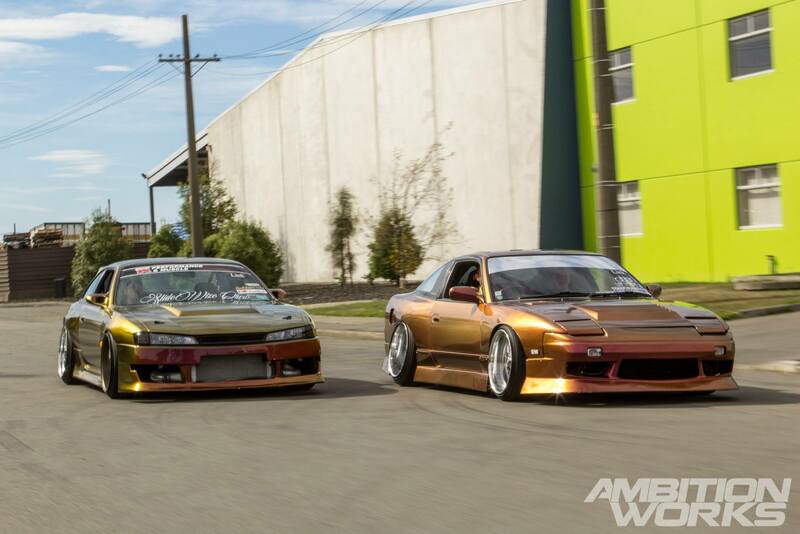 Jared blew an axle the previous day at D1NZ and was able to just get a new one fitted up in time for our photoshoot, which was lucky because these two cars are good on their own, but together they killing the car game down in Christchurch. 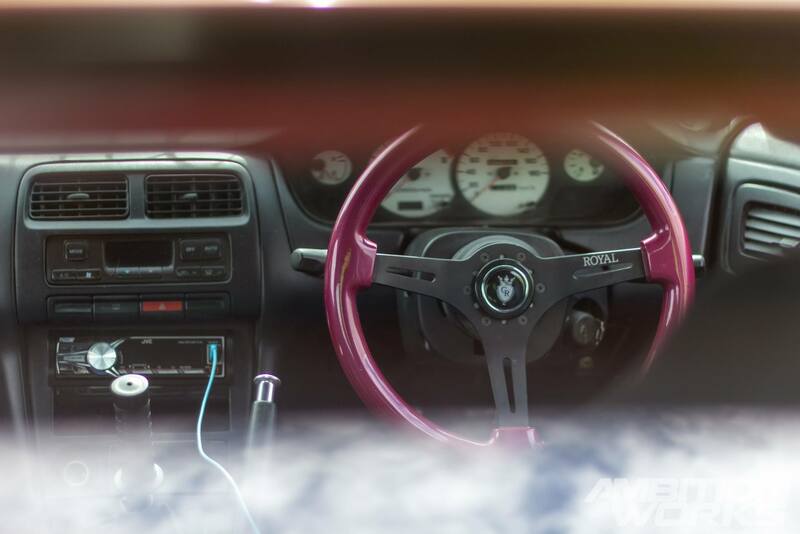 The interiors are somewhat neglected like most silvia owners, the essentials are added and nothing more. Both cars supporting Grip Royal by using their steering wheels. 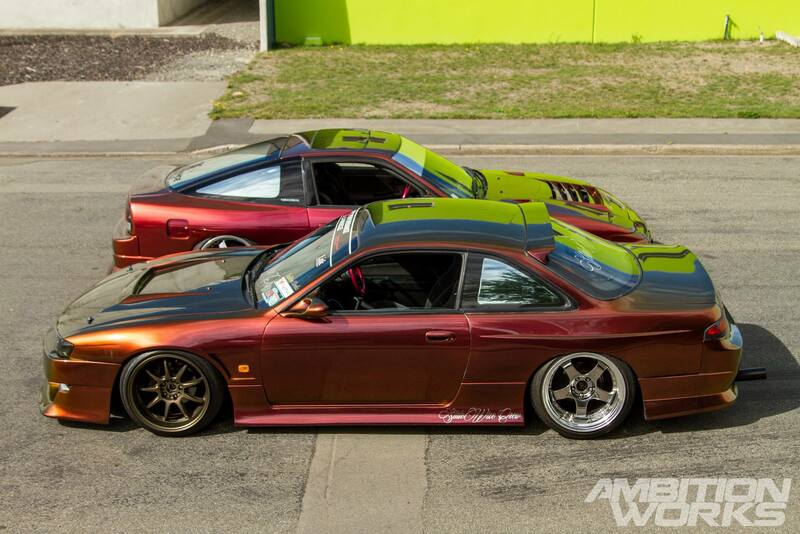 Roll cages a present in each car along with the 180SX being gutted and stripped of all the unnecessary weight. Cany contacted Madmyk and asked him to make up a custom handbrake shifter and gear knob for the S14 to bring a little bit more personalisation to the interior. Believe it or not, we didn’t make all of those tyre marks you can see here. The industrial areas of New Zealand are prime location for drivers to test out their whips or make a total fool out of themselves. Do they not look magical when driving sideways? Anyone can pull their handbrake, but not everyone can look so fresh doing it. It’s kind of like Need for Speed Underground, the game that started this obsession for most of us. We would do our cars up so much that the other cars on the road didn’t really look like a car at all. It was so plain and boring, and no one wants to live in a world like that. Things need to be vibrant and different, things should make you look twice in this world. This is how you stand out. Jared and Cany live by this viewpoint. It’s not getting from A to B, it’s how you get there. 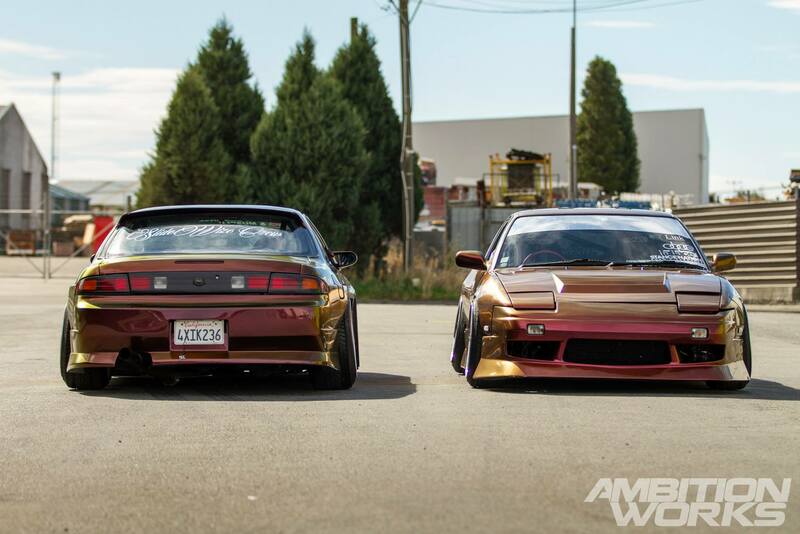 These two cars are not just for show. They can do the hella phat skids too. We would of had both going at it but Jared wasn’t to sure that his car would make it back home afterwards, so one would have to do. 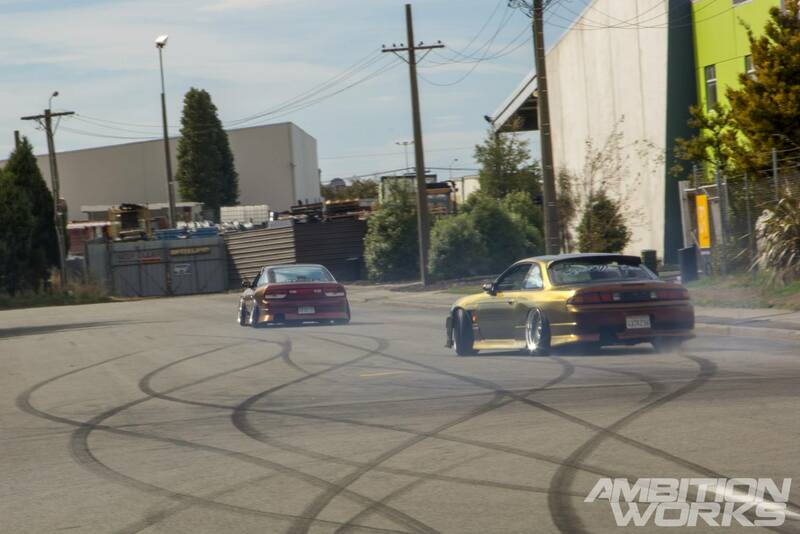 Who doesn’t like a burnout? The authorities that’s who. In an industrial area like this on a public holiday we weren’t annoying anyone, so just to be safe we headed back towards the main city before any of that unwanted attention showed up. 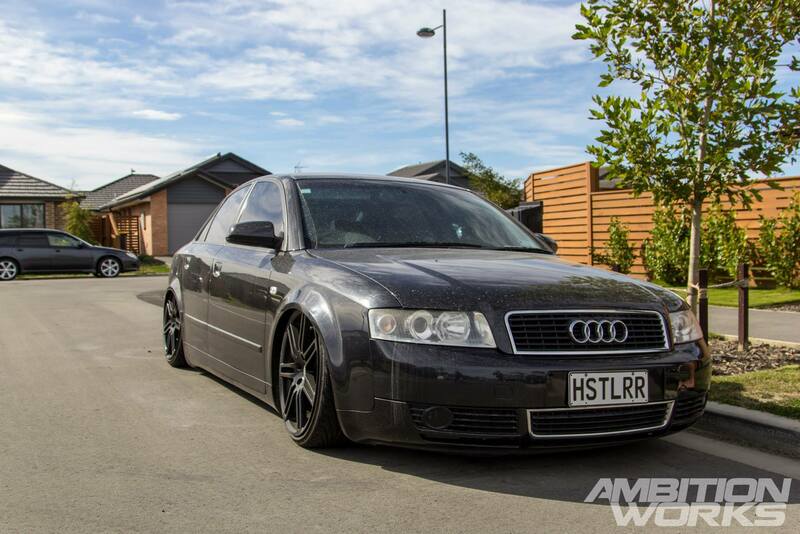 Back at their house Jared has this sweet slammed daily Audi to cruise around in. It’s dropped on airbags so can be raised to an appropriate level when driving around the somewhat unexpectedly bumpy Christchurch quake affected roads. Behind me sat an Altezza that was going to live its last days as a donor car to the other Altezza to the left of me. It was a fun filled neighbourhood where everyone seemed to get along nicely. It doesn’t come down to much really, you either want to stand out and be noticed or you don’t. Anyone can do it you just have to push for it. There is nothing wrong with blending however, and many people are comfortable doing that, hell if everyone stood out technically everyone would be blending in. So don’t be pressured by what others think is cool, do what you want to do. If you want to stand out go for it, if you want to blend in do it! It’s been a fast four days in Christchurch and it didn’t really feel like the holiday that I was looking forward to but I still had a blast exploring a new city with new people. It’s easy to make lifelong friendships on the road because we all have a common interest, that of cars. Jared says “A big thanks to Cany Customs AKA Cany Husslr for the countless number of hours he spent on it, also Bennie and Ron for helping out with the panel work. Spec Performance for the wiring and tuning. Most of all thanks to my very patient and understanding fiance Haylie, such an awesome woman and couldn’t have done it without her”. Cany gives “A big thanks to my best mate Jared for the vision of the build. My girlfriend Sally for putting up with the build. Big thanks to GTR Performance, Tint a Car for the tints, Budget Tyres for all the tyres we go through and all the stretching we make you do, and Ron’s panel and paint. The biggest thanks to the Slide Wize Crew for all the support and the fans and haters that we love so much”.